Random handing-off of sperm packets is probably more like it and there’s no regretting one’s choice, for they all soon will be dead. 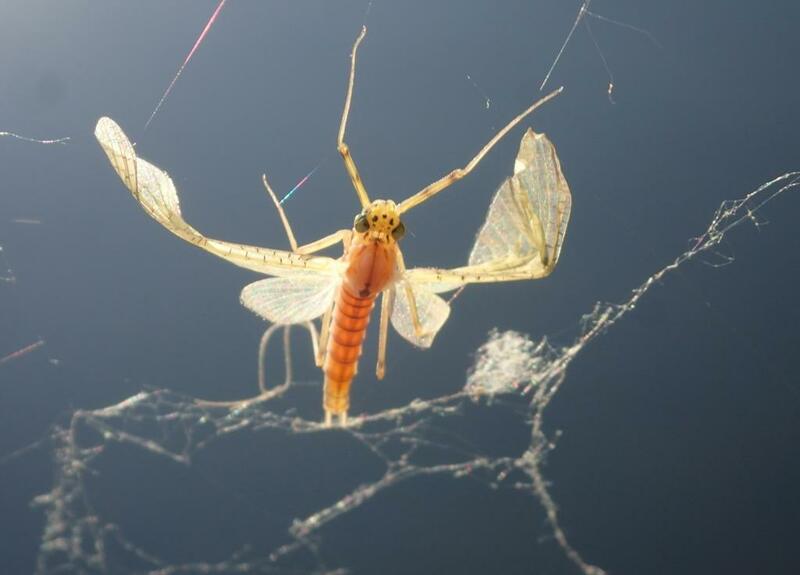 Such is the life of a mayfly. 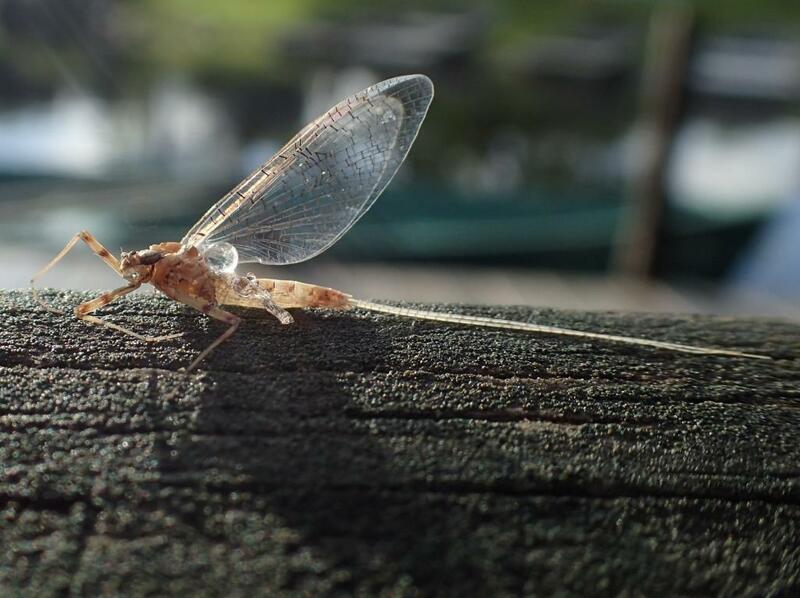 Half a dozen different mayflies have been coming off for several weeks, dominated recently by big Yellow Drakes. Their hatches can be memorable and plenty of anglers try to time their visits to Fish in a Barrel Pond to coincide. Sometimes, their timing is off and I have to fish by myself. Wearing a raindrop on its head while waiting for its sexual organs to form, that subimago (sometimes called a “dun”) Yellow Drake will shed its skin and take flight again this afternoon, joining others in a mating swarm above the lake. When they’ve done what they came to do, the males simply swoon and die. If they land on the water they will often be taken by trout, as will the females when they’re done bouncing on the surface, depositing eggs. 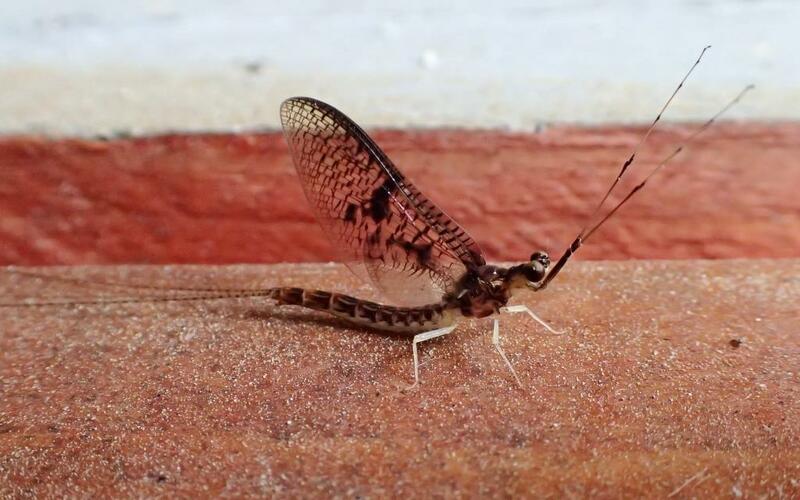 If they land on the dock they will more likely be picked up by me and placed on a bench for a photo or two, because the wings of imago mayflies (sometimes called “spinners”) are so pretty. This one was done for and could hardly hold itself up. 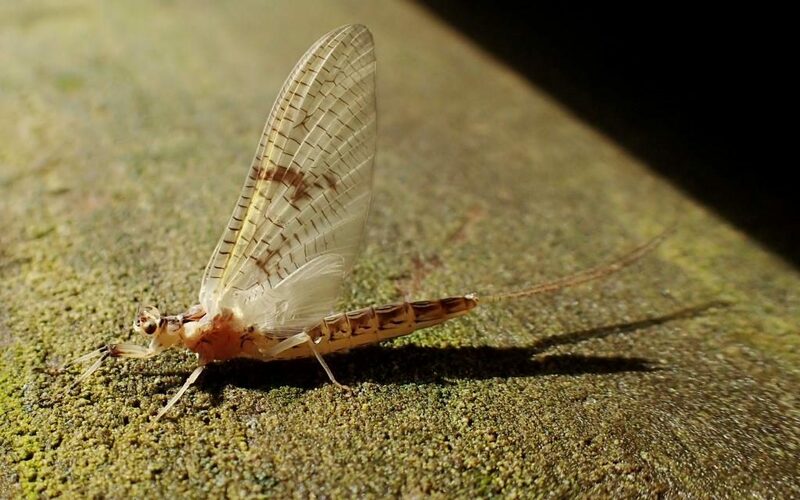 In hindsight, I should have put the two together and listened closely to hear what advice an old mayfly, all of a day old, might have for a new mayfly still getting its bearings after just a few hours. Maybe, as Benjamin Franklin suggested, its last breaths would be spent reflecting on “a long life spent in meaning well” and “the sensible conversation of a few good lady ephemerae”. Of course, not all ephemerae are so fortunate. Great treatest on may flies Prof. And don’t forget-“Say the magic word and the duck will come down with a $100 bill”.